Doris Freigofas and Daniel Dolz are Golden Cosmos. 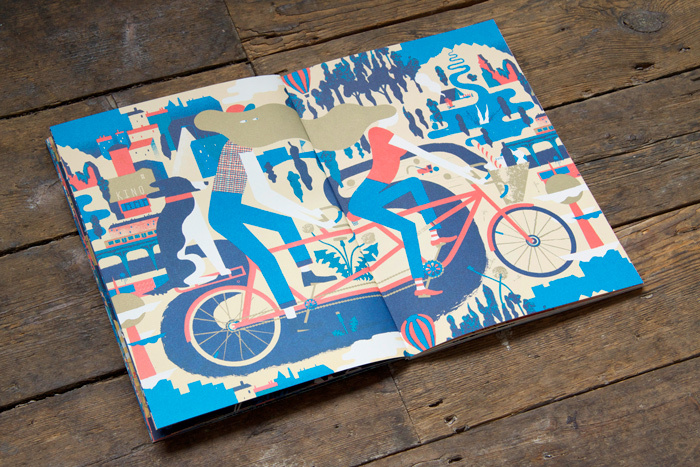 The Berlin based couple have been producing beautiful hand-printed books and illustrations since graduating from The School Of Art In Berlin. Doris contributed a spread to Nobrow 3 and she returned to collaborate with Daniel on a spread for our latest magazine with the theme ‘a few of my favourite things‘. We caught up with them to find out about their spread. NB: Do you really ride a tandem? GC: We used the tandem as a metaphor for being a team and acting in concert, having fun together and harmonising. We don’t actually own a tandem but we love cycling. We’d love to go on bike trips in the nature more often but our dog won’t run alongside, that’s why we strapped her on the luggage rack in our picture. 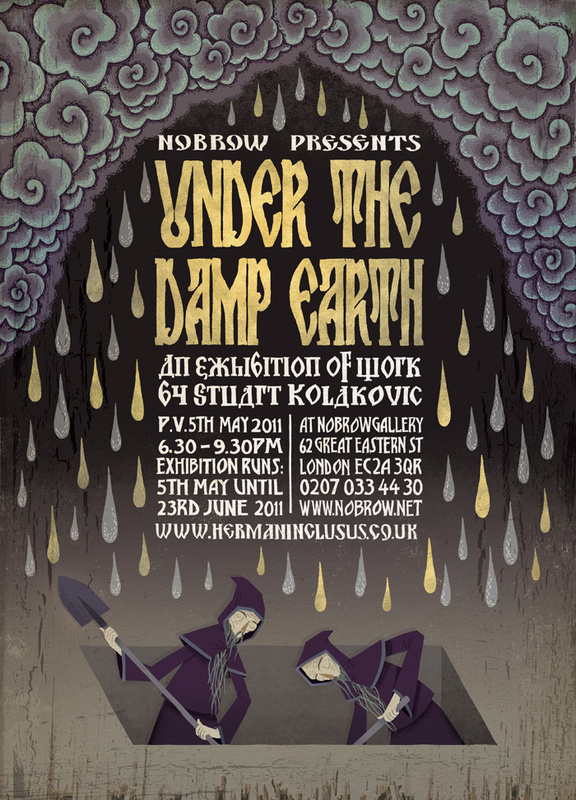 Read More..
On the 5th of May we will be hosting an exhibition by the brilliant Stuart Kolakovic. The ‘Under the Damp Earth’ show will act as a launch for our newly expanded gallery space. 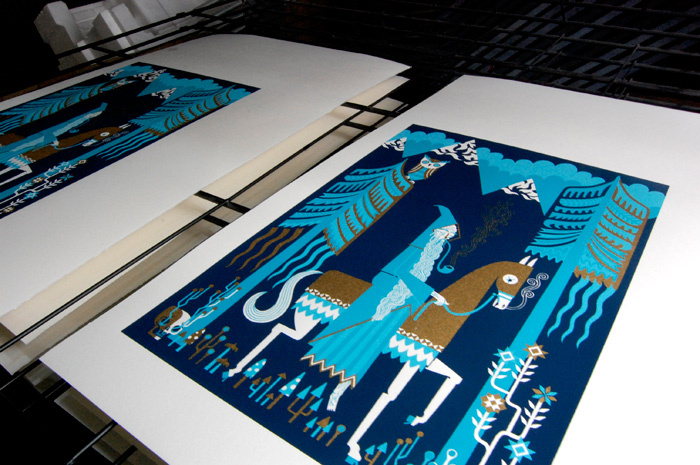 In preparation for this event we’re doing a duo of screen prints using luxury gold ink! 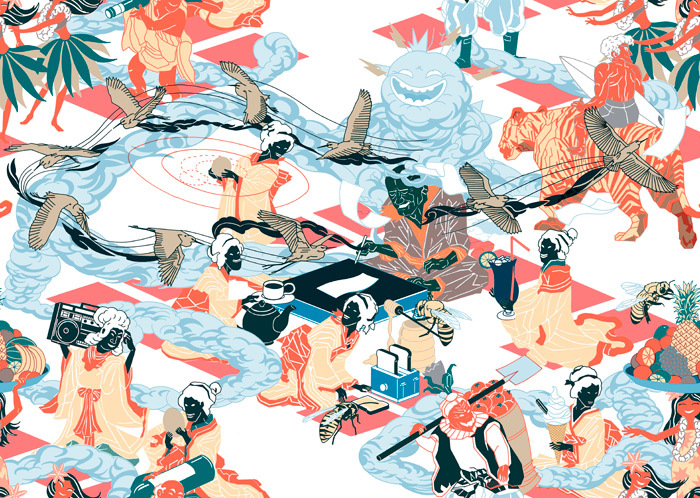 Here’s a freshly printed uncropped one from a limited edition of 50. They’ll be available to buy on the night before they go on sale online so come down to 62 Great Eastern St, EC2A 3QR, London on the 5th and get yours early! From this day forward Nobrow parcels shall be held together in style! 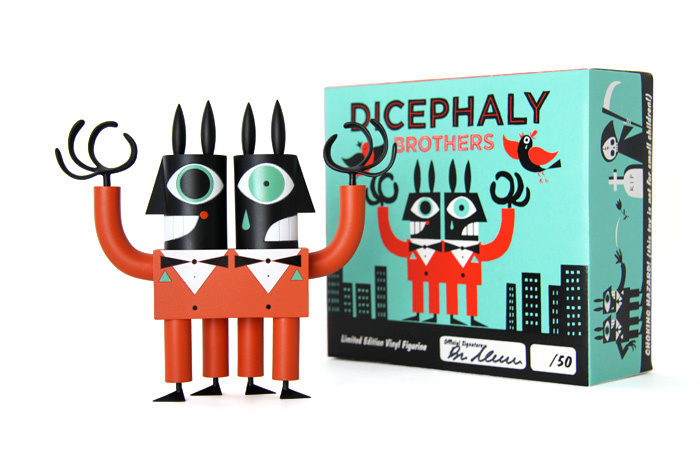 We worked with the brilliant Ben Newman to produce this new tape. So what if we’re being self-indulgent, it’s worth it! 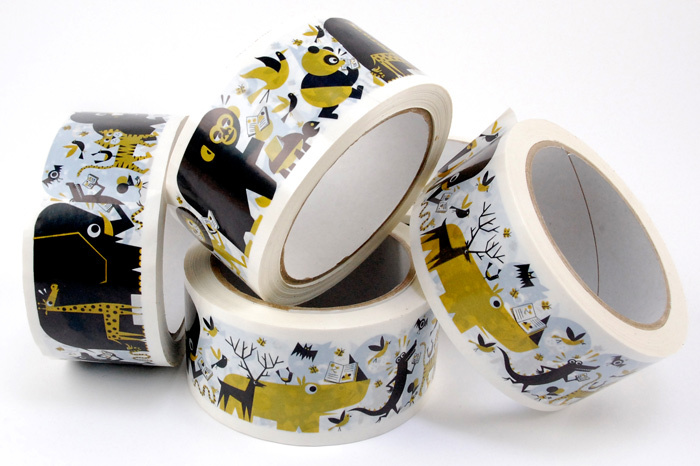 UPDATE: due to popular demand the tape is now for sale! Only 20 available! The New Ghost on the press! 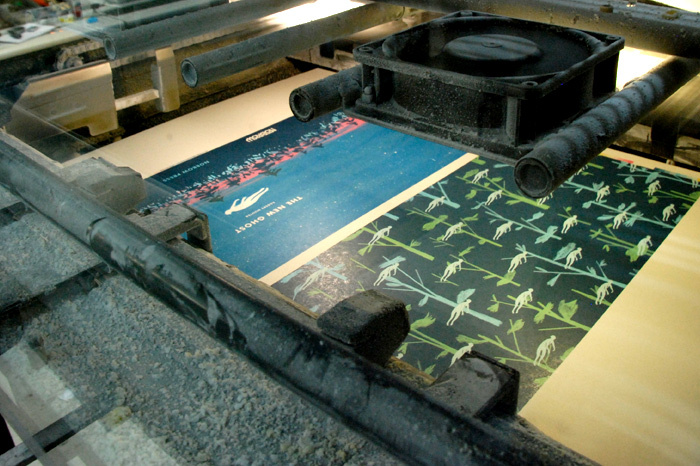 The New Ghost is currently flying off the press. Rob Hunter‘s debut comic is looking great and is going to be ready in time for TCAF!!! On the 5th of May we will be opening our new gallery space downstairs and what better way to launch it than with an exhibition from the brilliant Stuart Kolakovic. Upstairs in our shop will be a collection of work while downstairs, the new abundance of space will be used to its full potential. For the first time we will have an installation piece in one of our exhibitions. Stuart has been involved with us since our inception; illustrating the cover of our first magazine, contributing to a number of more recent issues and providing an excellent seven page comic for Graphic Cosmogony. He is continuing in his excellent vein of form with this exhibition and we are extremely proud to be able to host him. 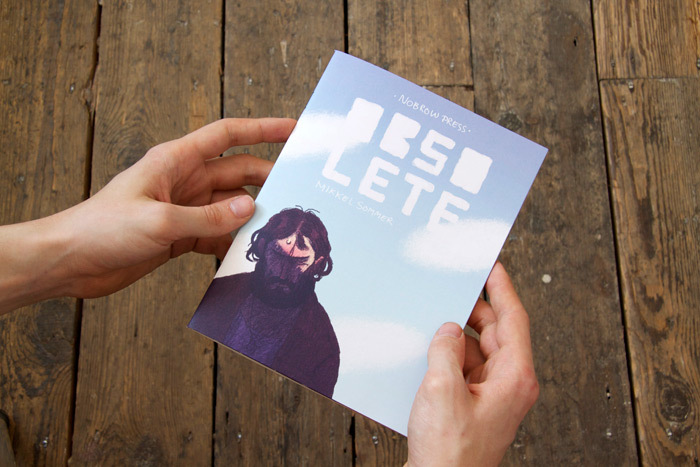 Obsolete by Mikkel Sommer arrived in our shop a couple of days ago. It’s now available on our site and our shop @62 Great Eastern Street. It looks great! We are eagerly anticipating the arrival of Obsolete here at Nobrow hq. The latest addition to our 17×23 range should get here any day now! Mikkel Sommer uses his distinctive sense of pacing and composition to construct a story around 2 ex soldier’s nihilistic and desperate behaviour upon their return home after a long stint fighting in a foreign land. 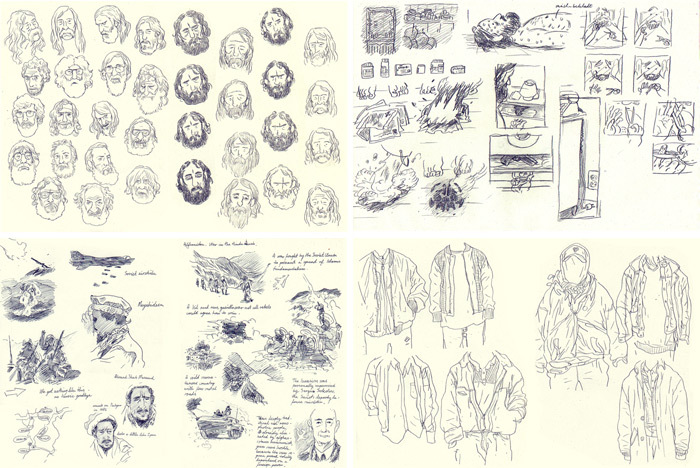 He also has a new profile on our site where you can see slightly bigger versions of the above sketchbook images and read a brief conversation in which Mikkel amusingly drifts between surrealism and solid fact. NB: What are your favorite things? JF: Well, based on the things that i included in the design..we’ve got honey on toast with a cup of tea…island life (preferably a tropical one), hula girls ..in fact girls in general , fresh fruits and vegetables, and the joy of growing them..eggs (especially chocolate / golden ones)…the birds and the bees..enjoying the creative process of drawing..using my imagination, pondering its connection to the cycles of nature, the weather the universe.and music.. strong long island ice tea…a nice bottle of red…..ligers..surfing and travelling…oh and ice cream. I guess those were the first things that popped into my head and fell out my pen, but i think i have other favourite things too..for example, getting into warm bed after working late on a freezing night or when you see a person bending over to pick something up..just at the exact same time someone beeps a car horn..but they’re not as easy to make into a pattern… Read More..
Nobrow is proud to announce our attendance at TCAF 2011 from Saturday May 7th, 9am-5pm to Sunday May 8th, 11am-5pm. 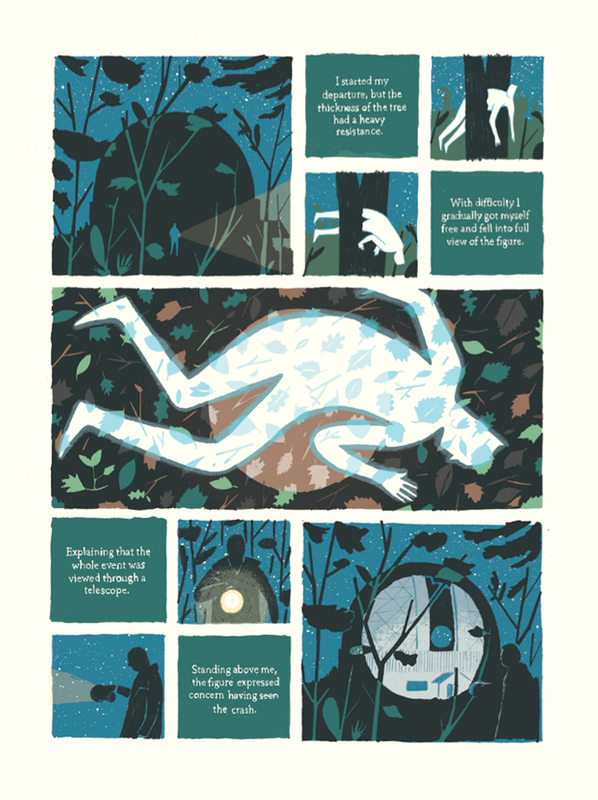 As well as bringing several ultra-recent titles from our catalogue, TCAF will also be the official launch of Rob Hunter’s hauntingly beautiful new comic The New Ghost (pictured below).